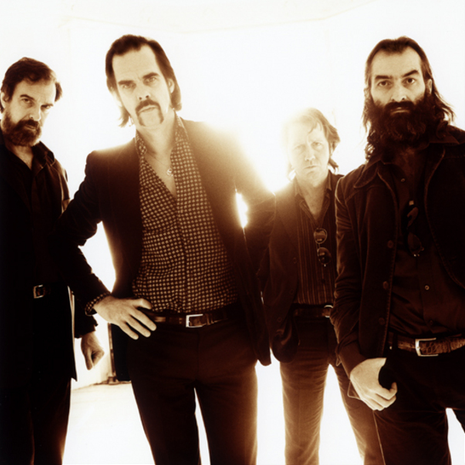 The first track from Grinderman 2 RMX – their remix LP – has surfaced. It is Silver Alert’s remix of “Evil”, with Matt Berninger (from The National) on vocals. And it is really good. Really. And if this is a taster of what is to come on the remix LP then I think we are in for a real treat. This is more a complete re-working of the song, from the ground up, rather than a straight-forward re-mix, and that is what is really exciting – it is a whole new track. It sounds like Portishead have got their hands on the music, just after doing a heavy batch of meth. The loops grind and grow ominously, in all their super-low-pass-filtered, lo-fidelity beauty. The guitar has been jettisoned in favour of industrial noises (which wouldn’t be out-of-place in a Saw movie). And Nick’s vocals are all but gone, although there is some lo-fi gurgling “baby, baby, baby” which sounds suspiciously like him. Instead Matt Berninger (from The National) takes over and re-interprets chunks of the vocal with his typical, fantastic, vocal style.